Welcome to the fantastic vacation community known as Sundunes in Navarre Beach, Florida. This spellbinding area is packed to the brim with countless vacation activities. From swimming in the ocean to enjoying the gorgeous sunsets on the boardwalk, friends and families of all ages are sure to have a great time! 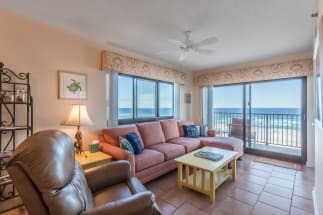 This condo complex stands at an impressive 9 stories and sits Gulf front to the beautiful emerald waters of the Gulf of Mexico. All units in this complex are 2 bedrooms and 2 baths, sleeping 4-6 people. The units all have balconies that perfect for your morning coffee. The complex offers a community pool that sits Gulf front as well. While in the area we highly recommend visiting a few of the local seafood restaurants. These gourmet eateries have fresh seafood delivered daily and offer a variety of succulent cru stations from the nearby ocean. If you are traveling with small children, we recommend checking out the Gulf Breeze Zoo, the Gulfarium Marine Adventure Park or the Panhandle Butterfly House. Book your Sundunes con rental with the property owner through ECBYO. 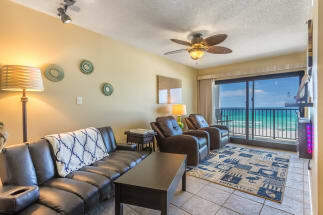 Emerald Coast By Owner allows you to book directly with the property owner or manager. This allows you to receive the best information on the property and the best rate. We hope you enjoy your vacation to Navarre Beach, Florida!